When a superhuman terrorist group that calls itself The People sparks a violent uprising, the country famed for its incredible technology and proud warrior traditions will be thrown into turmoil! 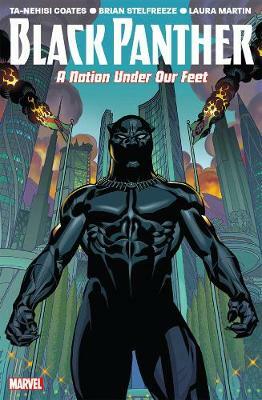 As Zenzi and Tetu, leaders of The People, poison the populace against its king, the spirit of T’Challa’s presumed-dead sister, Shuri, makes a transformative journey through Wakanda’s past, and a group of heroes, including Storm and Luke Cage, come together as The Crew to help Black Panther out. If Wakanda is to survive, it must adapt — but can its king, one of a long line of Black Panthers, survive the necessary change? Heavy is the head that wears the cowl! A native of Baltimore, Maryland, Ta-Nehisi Coates is one of literature’s most important and respected voices. Juggling duties between journalism, teaching, books and comics, Coates’ work for The Atlantic was particularly important in establishing his reputation as perhaps America’s most significant commentator on race and society. Two works - The Beautiful Struggle and Between The World And Me, the first a memoir and the second a masterful, personal history of America and the black experience – are essential. We Were Eight Years in Power is his insightful collection of articles covering the presidential tenure of Barack Obama. Simultaneously, Coates has been raising the bar in the field of comic book writing, principally for the character Black Panther.